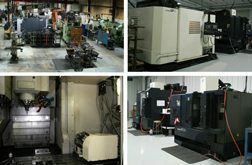 Our CNC Milling department would like you to come and see the impressive Okuma and Makino machining centers (20 strong – horizontal and vertical) that we have to create high quality parts. Here is the Okuma MA-650VB five axis vertical milling center. This versatile machine is able to accommodate multiple cutting and finishing needs on a single machine. The Makino V56 models have laser touch-off, glass scale feedback and a 20,000 RPM spindle. Call us today for a walk through of the facility.